Distil. 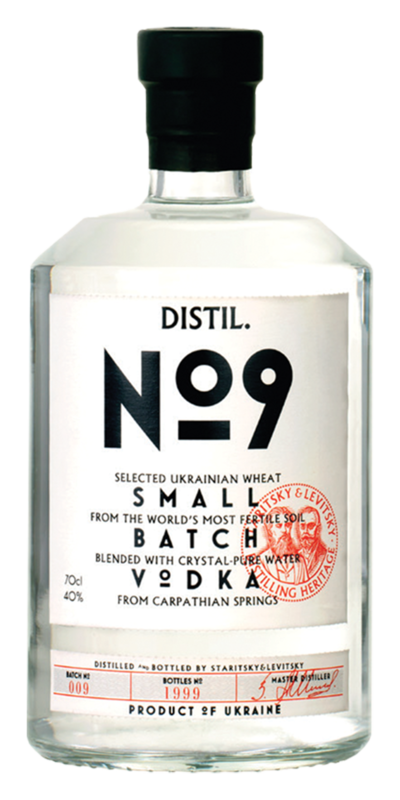 No 9 Vodka | Small Batch Vodka | Ukrainian Vodka | Vodka Belt | Carpathian Mineral Water — Emporia Brands Ltd.
Staritsky & Levitsky are a group of vodka enthusiasts, passionate about reviving the heritage and traditions of authentic, small batch vodka distillation in the historic birthplace of vodka production. After years of field trips, tastings and recipe research in the geographic "vodka belt" of Europe (Russia, Ukraine and Poland), they found - in 2010 - the perfect place for their venture in the city of Lviv, Ukraine, close to the Polish border, where they started the distiller Staritsky & Levitsky.Distil. No9 is a premium vodka from the Staritsky & Levitsky distillery. The vodka is the modern interpretation of a traditional Ukrainian recipe and is a young, fresh vodka for any occasion. It is the result of S&L's master distiller research into Ukraine's distilling traditions. After making a large number of batches, distillation No.9 produced an exceptional result. Distil. No9 is distilled five times and purified four times (twice through brick charcoal and twice through rhinestone). It is produced in single batch 9,999 bottles. Nose: Pure alcohol, with pleasant freshness and a spicy tint of herbs. Palate: A medium intensity, fresh and natural, pure grain, with a note of fresh bread and spices.